Peacocks are male birds which are members of the pheasant family. They are royal blue or green in color. They have beautiful fanlike tails which are often referred to as trains. The females of this species are called peahens. The feathers on these tails have areas that are called eyes. Peahens do not have the fanlike tails that the peacock has. The whole group of the pheasant family are called peafowl. Peafowls are found in India, Pakistan, Sri Lanka, Southeast Asia and Central Africa. Peafowls eat plants, flower petals, seed heads, insects as well as other arthropods, reptiles and amphibians. Peapowls are omnivorous animals. Peafowls live in forests in ground nests. Peafowls are sometimes kept as pets because they are so very beautiful. 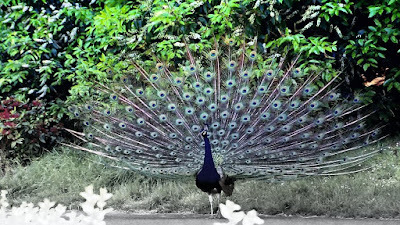 There are three types of peafowl in the world: Indian, green, and Congo. 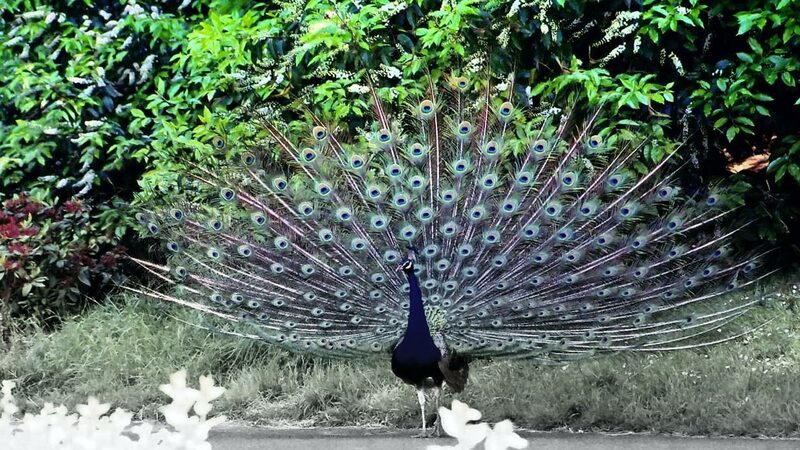 Indian peafowl live in India, Pakistan, and Sri Lanka, green peafowl are found in Southeast Asia, and Congo peafowl are from Central Africa. Peafowl are often called urban guard dogs because they will cry out when unkown people are approaching.